Find the perfect window treatment for your home or office. Window blinds allow you to find the perfect window treatment for your home and office. They come in a wide range of colors that will complement the decor of any room of your house. You can even add the same blind style to the whole house; it would provide a distinctive touch of class which will be visible from your visitors. They will probably congrat you for the great design of your house. However, what they probably don’t know is that a good designed house begins on the suitable light for each place, and you can achieve it with window blinds. Choose the color for your home decorating plans and find exactly what you want for the whole house. Each part of your home needs a special care as well as a distinctive style. If you are looking for break the look of any room, definitely your best choice is adding new window treatments. They will simply change the light coming in from the outside and through windows, giving you the desired ambient. Find out what we have to say, and read our window blind tips. Find discount blinds online. There are many styles and colors to choose from. They will fit any type of windows or doors in your home. You can choose since roller or vertical types in a color that matches your walls or a pleated fabric blind in an accent color to provide contrast. We can help you to decide on the type and color of window coverings you want. However, and whether you are not able to find the most suitable blind for any of your windows, or simply you want to design your own styled blind, read our article on custom blinds, it will provide you the best tips on blinds designing. 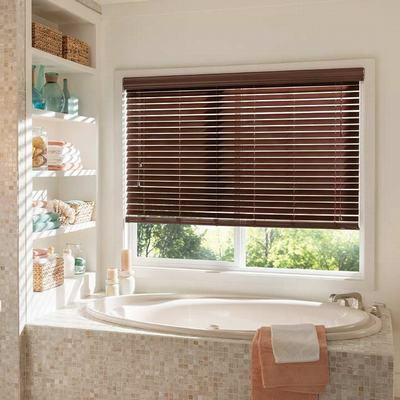 Mini blinds are versatile, easy-to-clean as well as easy-to-install blinds. They are ideal for sliding patio doors or blinds for arched windows. These models of blinds are usually constructed from PVC or metal. An important feature that only mini or macro blinds are able to perform is that can be raised, lowered and tilted to let in sunlight. You can find mini-blinds from ½” slats up to standard blinds of 1". You might buy 2" macro-blinds, which are all readily available at economy prices. Select amongst faux wood blinds and have the look and feel of natural wooden ones. They are easier to maintain and more durable than their wooden blinds counterparts. You can find them made from composite (PVC and wood-pulp) or PVC which makes them heavier and more flexible than natural wooden ones.